Let's not start with CDJ straight away (yup, you're right! That's Consumer Decision Journey). Instead, think about the Internet and how it has changed so many aspects of our lives! Here, I'll focus on the way we communicate - and not just on a personal level! These changes are huge - and yes, I know you know this - but they are even more important in the marketing world. Basically, they make older marketing models obsolete! Something like the Purchase Funnel model belongs to pre-Internet era now. 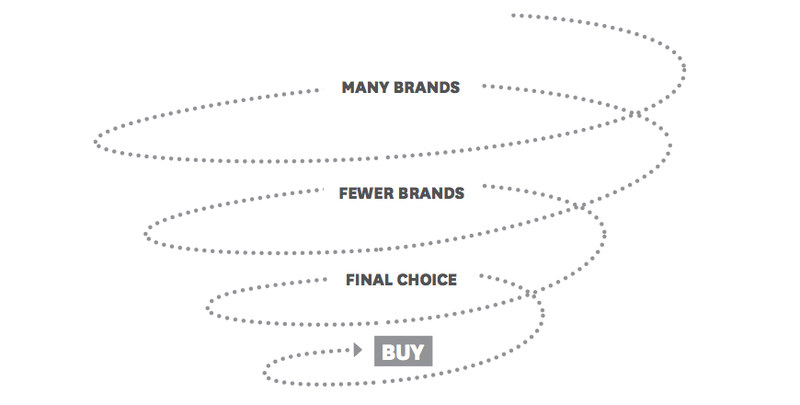 What the Purchase Funnel model assumes is that consumers start with a large set of brands in mind and systematically narrow it down to a final choice, and after purchase, they don't have any relationship with the brand - except for the product or service itself. So now, why is the funnel dead? Simply because it doesn't take into account the fact that people's relationship with the brand doesn't end after purchase anymore. Also, people don't just start with many brands in mind, and that set is subjected to change. Let me explain. Consider the reviews on Amazon, eBay, Yelp, TrustPilot and others (the famous list of Twitter, Facebook, Google+, YouTube, etc) about products and services of different brands! Those are there because customers put them there after they experienced a product/service! Consumers don’t stop their relationship with the brands after purchase anymore. They keep talking about them – whether positive or negative. Oh, and you know what? This is something brands hardly have control over – sometimes don’t even know about! Understanding this, we need a model that gives us the ability to make sense of these new touch-points. Introduced by Court et al. (2009), Consumer Decision Journey (CDJ) is a model that helps brands make sense of their relationship with their customers, even after purchase. CDJ shows how instead of systematically narrowing down their choices (what they do in the Funnel model), customers start with a set of choices in mind and then in an extensive evaluation phase, they modify that set (by adding and subtracting) choices until they make their final decision and make the purchase. This extensive evaluation phase is considered to be a result of the information age. Easy and cheap access to information, recommendation engines and online communities create informed customers who take their time and do their research before making a purchase decision. Purchase is not the end of a consumer journey. Not anymore. After purchase, customer’s relationship with the brand doesn’t end. In fact, it turns into an open-ended relationship with the brand. The consumers continue their experience with the brand to enjoy [or hate], advocate [or criticise] and bond with it [or not] – and they share that experience online. If they actually bond with the brand, next time, they won’t start with many brands in mind to then evaluate! They are more likely to be loyal to their favourite brand (The Loyalty Loop). Looking at our costumers through the lens of Consumer Decision Journey (CDJ), we can begin to understand, and therefore, plan and act based on the stage they are at. These are the touch-points we didn’t have before the rise of the Internet. Now that we have them, we need to make sense of them and use them to optimise our marketing, advertising & branding efforts. And this will be the topic of my next post. Stay tuned!